Shameik Moore and Jake Johnson introduce a new sneak peek for Spider-Man: Into the Spider-Verse and talk about the exciting upcoming animated movie. Moore notes that it's the first superhero movie to feature a bi-racial lead before showing off some awesome never-before-seen clips. Moore voices Miles Morales, while Johnson provides the voice of Peter Parker. The duo released the latest footage to celebrate the debut of the new Spider-Man PS4 video game, which is currently consuming the lives of many fans of the webslinger. All of the promotional material for Spider-Man: Into The Spider-Verse has been stunning, showing off a unique spin on the comic book genre and the latest trailer is no exception. The animation style is utilizing elements from comics, including speech bubbles and even splash panels, but in a new dimension. The movie truly looks like a living and breathing comic book, but with camera angles that couldn't exist in the real-world, providing a fresh and vibrant look at a character that Marvel fans know so well. Instead of putting the focus on Peter Parker, Spider-Man: Into The Spider-Verse stars Miles Morales, who learns that there are a lot of other people like him and Parker out in the world. Jake Johnson's Parker character serves as a mentor to Shameik Moore's Morales, who says, "Miles has got to learn from the more experienced Spider-People." Parker doesn't want Morales to follow in his footsteps and wants him to learn from the mistakes that he has made over the years. Hailee Steinfeld provides the voice of Gwen Stacy, aka Spider-Gwen, while Nicolas Cage voices Spider-Man Noir. In addition, John Mulaney voices Peter Porker, aka Spider-Ham, and Kimiko Glenn voices Peni Parker. Marvel has a lot of Spider-Man going on in the world today. There's the release of the aforementioned PS4 game that has been incredibly popular, the teasing of Spider-Man: Into The Spider-Verse, the upcoming release of Venom, and the Marvel Cinematic Universe's Spider-Man: Far From Home, which is currently filming in England. Basically it's a great time to be a fan of Peter Parker, and Spider-Man: Into The Spider-Verse is going to give fans a new take on the beloved webslinger. Spider-Man: Into The Spider-Verse was written by Phil Lord and directed by Bob Persichetti, Peter Ramsey, and Rodney Rothman. Persichetti revealed that they needed a good reason to make another Spider-Man project, and stated that telling the Miles Morales was the best idea, since his story had not been told on the big screen before. To nail the authenticity of the character, Brian Michael Bendis, the co-creator of Miles Morales, was brought on to consult for the animated film. While the tone of the story isn't evident quite yet, the computer animation style is groundbreaking and completely in a league of its own, living up to the goal that Phil Lord had from the start. 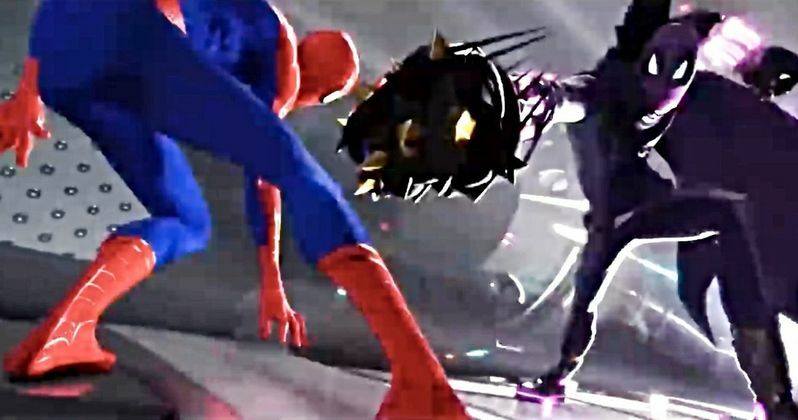 Spider-Man: Into The Spider-Verse opens in theaters on December 14th and you can watch the new sneak peek below, provided by the Furious Trailers YouTube channel.